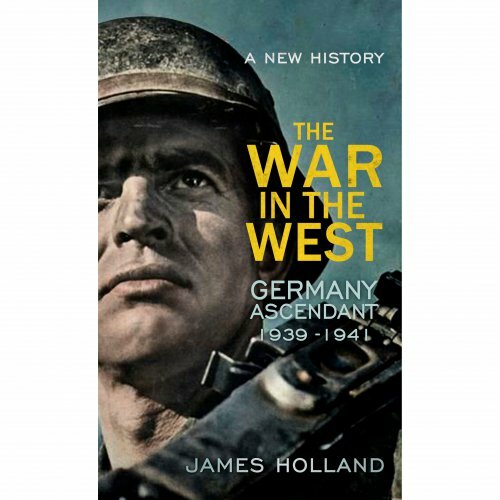 12 years in the making, James Holland’s latest book The War in the West : Germany Ascendant 1939-1941 goes on sale today and is the beginning of a new three volume examination of the events of the Second World War. This first book takes a look at the opening years of the war from a rather new vantage point – the operational level – and is blended well with the more traditional tactical and strategical levels. James excellently draws on a host of fascinating first hand accounts to offer a fresh new look at proceedings, as well as challenging many of the popular myths and perceptions about the war including British incompetence and unreadiness, and also Nazi Germany’s military superiority. Without trying to give too much about this book away as it really is a page turner, it is far from your stereotypical history book charting the chronology of military proceedings. The true scope of James Holland’s examination is impressive, incorporating a wide breadth of social, political, economic and military factors and minute details that many people may ordinarily overlook. One chapter for example you could be learning all about British, French and German weaponry and military clothing, the comparison between them as well as what this says about those making them. Then in the next, you could be reading all about the war in the Atlantic and the troubles facing the Merchant Navy from Germany’s U-Boats. This is one book not to be missed, a terrific and thought provoking read, it is brilliantly written and you will find it very hard to put down as you learn something new with every turn. I’m already reserving space on my bookshelf for the next two books as I eagerly await their release in what is sure to be an excellent trilogy. With multiple copies to giveaway, Ross and I are giving you the chance to get your hands on your very own copy of this fantastic new book. All you simply have to do, to be in for a chance of winning a copy is subscribe to our FREE newsletter. Existing subscribers will be automatically entered and the winners will be picked at random once the competition closes at midnight on Saturday 19th September.